Oh, I know your Thanksgiving menu is probably planned and I think that is great! I actually had no intention of trying to convince you today, this late in the game, that you absolutely must include such and such recipe on your holiday table. I know you’re committed and that’s that. But for the rest of you slackers, it’s your lucky day! This is your Thanksgiving salad. Period. I have taught it umpteen times already this month, with another class to go and I am more obsessed with it than ever. I think this salad actually makes turkey taste better!! Make some room on that menu! Delicata squash should be nicknamed “THE Thanksgiving squash” because it’s seasonal, adorable, and minimal work. You don’t peel it! You eat the skin! It tastes amazing! How much do you love me right now? Forget butternut squash this year. Give yourself a break and go with delicata. I have no idea if you can find it where you live, but in Southern California it’s all over the place at every supermarket, farmers market and Trader Joe’s. Sometimes it’s off-white with yellow stripes, sometimes pale yellow with orange and lots of in-betweens. 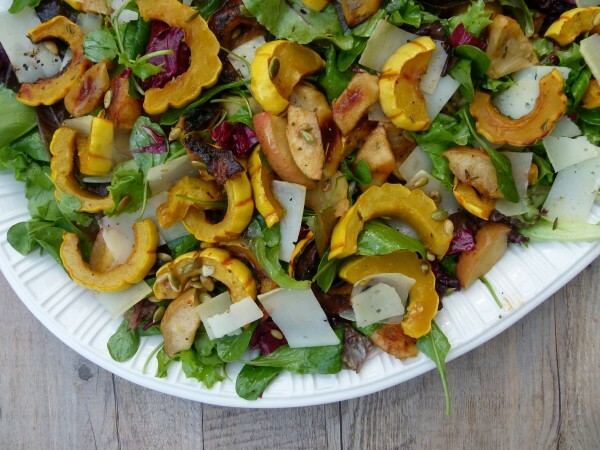 As much as I love delicata squash, my favorite part of this salad just might be the big wedges of roasted apples. Pink Ladies are my favorite and I think are perfect here, but Honeycrisp, Fuji, Jonagold are all great, too. Granny Smith is a little too tart in my opinion. Leave the peel on to not only make your life easier, but I think the apples look prettier that way and hold their shape better. right before carving the turkey, assemble and dress the salad! Preheat oven to 400 degrees and line 2 baking sheets with parchment paper. 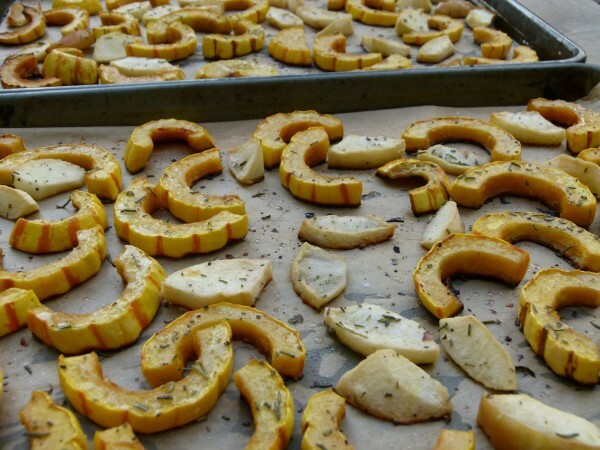 Place the apples and squash in one layer on the baking sheets and sprinkle with rosemary, salt and pepper. Roast until tender, approximately 20-30 minutes. Remove from the oven and set aside to cool. 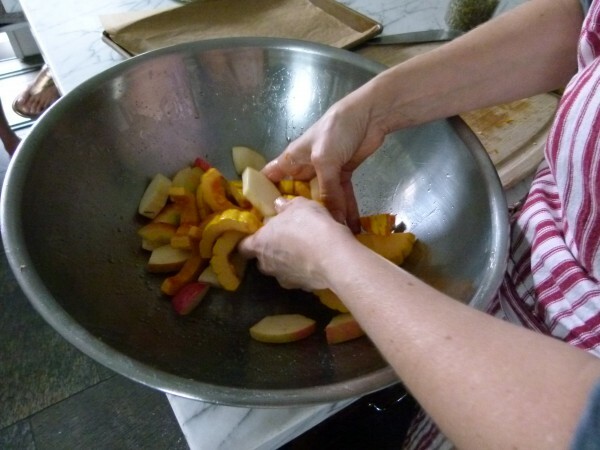 For the dressing: in a small bowl or screw top jar combine apple cider vinegar, olive oil, Dijon, salt, pepper and maple syrup and whisk or shake to combine. You may have more dressing than you need for this recipe. Place salad greens on a platter and toss with enough dressing to coat lightly. 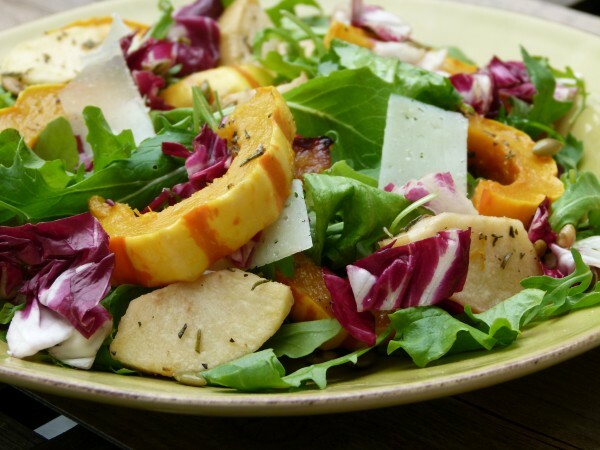 Separately drizzle the squash and apples with some dressing and add to the greens. Sprinkle with any desired toppings. Taste for salt and pepper and serve. « planning a happy thanksgiving — 1 week and counting! Is this salad still worth it without the cheese? any vegan substitutions? Absolutely! The cheese is totally optional and not my favorite part of the salad. No need to sub anything in its place unless you have a clean vegan cheese you like. It’s one of my favorite Thanksgiving salads! I made this salad for a dinner party and Thanksgiving and it was devoured. Several of friends have made it based on my recommendation with positive results. I added pomegranate seeds for extra twist. What can I do of this ahead of time? I am trying to think through my Thanksgiving timetable because everyone is coming from out of town so everything has to be made in my kitchen! I made this as well on Halloween. My sister said “this is like fall in my mouth!” I can’t even describe accurately how much I loved this salad. I had just enough for one serving the next day and I brought it to my son’s teacher because I knew she would love it. She couldn’t stop staying how fantastic it was. She loved the pumpkin bars too. 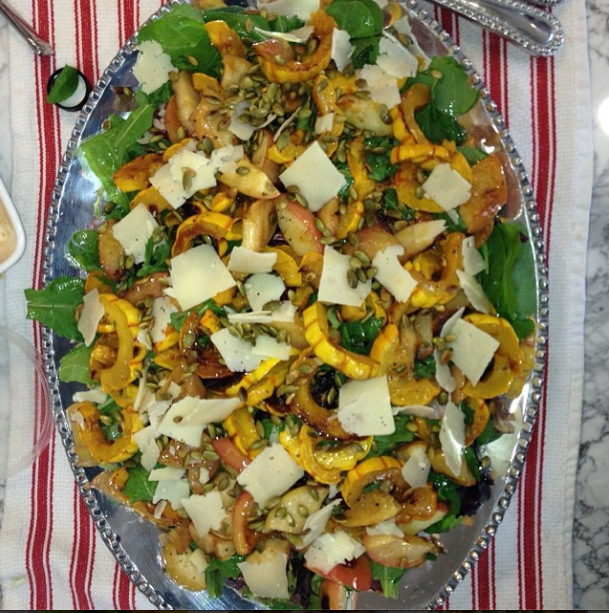 I really adore delicata squash and can’t wait to make this again. Thank you for another yummy recipe. Yay! This is my favorite holiday salad ever. So glad you enjoyed it! This salad recipe calls for five tablespoons cup of olive oil. Is it 5 tbls. Plus a cup or just 5 tbls. Of oil?? Thank you, Bonnie! How is it that you are the only person to catch that? Corrected. 5 Tablespoons of olive oil. Enjoy! This salad is excellent. I have never had delicata squash before but it is now a favorite in our house. I have served just the roasted squash as a side with other meals. My sister ( great job Jen) made this for Thanksgiving dinner and was DELICIOUSLY FANTASTIC! So savory & the fabulous smooth combo of flavors was the hit for me. I can’t wait to make for my family. This is a hit! My family likes tradition and we usually make my grandfather’s same Thanksgiving recipes every year. I loved this salad from your cooking class last week so I added it to the mix this year and it was a hit! I think it will be a new Thanksgiving tradition – thank you for the great recipe and the confidence from your classes that I could do it! Supposed to make it for a friends tihs evening and tomorrow. Ugh. Check the co-op in Santa Monica or just use acorn squash or peeled butternut. It will still be great! This salad looks good! I don’t think I’ll be able to find delicata squash or manchego cheese though, what would be the best substitutes? I will certainly look, but with only one small grocery store in my rural town, I’m probably out of luck. Thanks for the recipe! Ellie, you asked a good question! See what winter squashes your market has — acorn would be a good sub (don’t peel) or butternut squash (peel.) As for the cheese, you don’t necessarily need it, but I think so many cheeses would be lovely here like cheddar, gruyere, parmesan. Whatever you get, just shave it with a vegetable peeler so you have nice thin shavings of it. Hope those suggestion help! Thank you and happy Thanksgiving to you too. One of the many things I’m thankful for is your blog and the tremendous inspiration it has given me. Enjoy family, friends and food! So sweet. Thank you so much, Barbara. Hope you have a beautiful holiday! 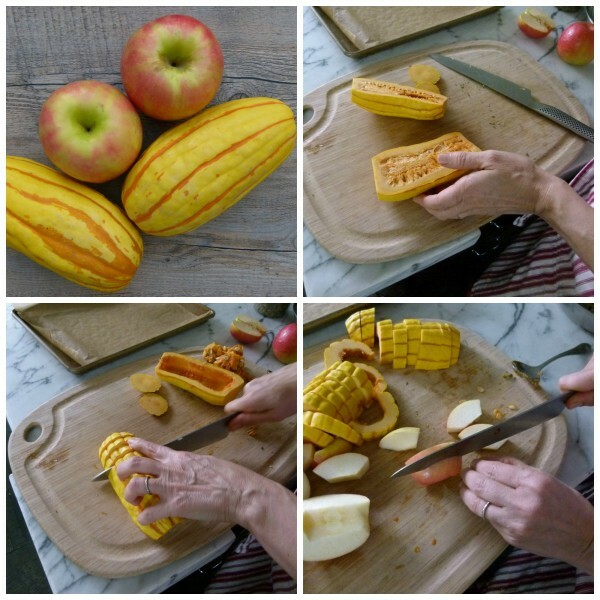 Lucky for you winter squash stays good for a long time on your counter, a few weeks is fine!